"A surging, seething, murmuring crowd of beings that are human only in name, for to the eye and ear they seem naught but savage creatures, animated by vile passions and by the lust of vengeance and of hate". "The lust of blood grows with its satisfaction, there is no satiety, the crowd had seen a hundred noble heads fall beneath the guillotine to-day, it wanted to make sure that it would see another hundred fall on the morrow." Before Zorro, before Batman, Superman, The Lone Ranger or the other heroes of today, each with their own secret identities, came the larger than life figure of The Scarlet Pimpernel, a British aristocrat who was determined to save as many of his French counterparts and their families as he could from the cruel blades of the guillotine. A master of disguise, a courageous man who with brilliant planning and a cunning execution rescued noble families right from under the very noses of the revolutionaries. After each rescue he would taunt them by leaving his calling card, a card bearing the picture of a small red flower, the Scarlet Pimpernel, which ensured his notoriety among the populace and that his name became a word-of-mouth legend throughout France. Should he be captured, he too would be paraded before the blood thirsty masses before suffering the same fate that was planned for those he saved. 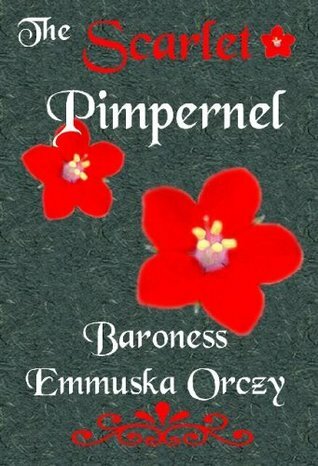 The Scarlet Pimpernel along with his small but loyal cadre of friends made journey after journey from England to France to give these people a chance for life. The book has all the requisite cast of characters; Chauvelin, a determined and shrewd agent for the Committee of Public Safety, who will go to any lengths to learn the identity of and capture this man who has so frustrated them. A villain of the first order. Margarite St. Just, former French actress, now wife of the very rich but silly and foppish (or is he?) Englishman, Percy Blakeney, and part of the social elite. Although reportedly the smartest woman in both France and England, she does some of the dumbest things imaginable yet is feted by all society and lauded for her wit, beauty and intelligence. We have noblemen from England who help The Scarlet Pimpernel with his rescues, even The Prince of Wales makes an appearance. Throughout the book we have many characters who are hiding behind the masks of their social persona, seemingly one thing yet hiding their own secrets. This is basically a story of adventure, of derring-do, with romance thrown in to sweeten the pot, but still, it is an adventure story with non-stop action from beginning to end with characterization an after thought. No, wait! Perhaps a better description would be a romantic adventure, as romance is a key ingredient. However you want to describe it, it is still great fun! The author makes no attempt to explain just how these slight of hand rescues take place nor does she get bogged down with details of any of the intricacies involved in the planning, it is enough that we are shown the final results. The story thus moves along with breath taking speed and is rollicking good fun. It is easy to see that the author's sympathies lay with the French nobility (after all, she is a Baroness), but no matter who the reader is rooting for, this is still an excellent adventure story. It's fast-paced and hard to put down. Once you start reading you just want to keep going. The ending is predictable but that's acceptable, in this case it's even preferable. I absolutely adored this book but have no desire to continue on with the series. It was an enjoyable ride but but lacked the depth to lure me into reading another.